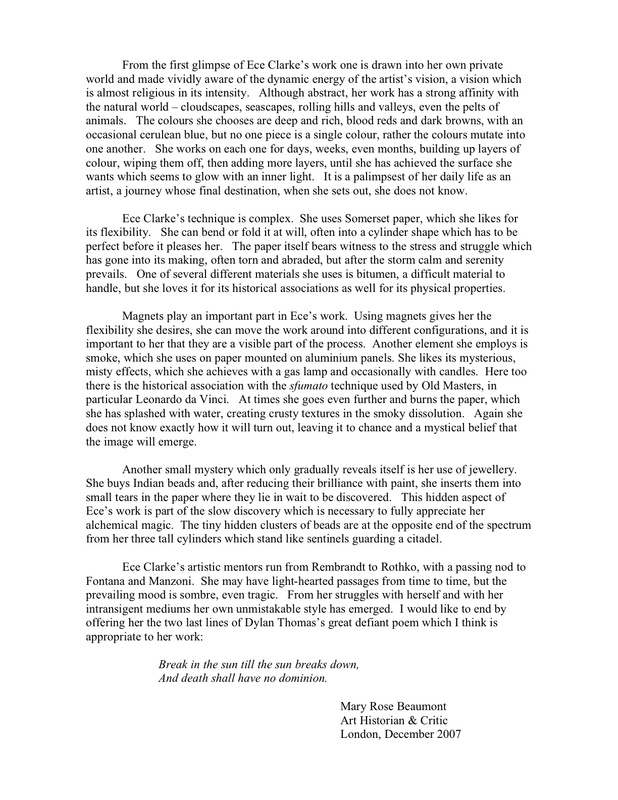 From the first glimpse of Ece Clarke’s work one is drawn into her own pri­vate world and made vividly aware of the dynamic energy of the artist’s vision, a vision which is almost reli­gious in its inten­sity. Although abstract, her work has a strong affin­ity with the nat­ural world — cloud­scapes, seascapes, rolling hills and val­leys, even the pelts of ani­mals. The colours she chooses arc deep and rich, blood reds and dark browns, with an occa­sional cerulean blue, but no one piece is a single colour, rather the colours mutate into one another. She works on each one for days, weeks, even months, build­ing up layers of colour, wiping them off, then adding more layers, until she has achieved the sur­face she wants which seems to glow with an inner light. It is a palimpsest of her daily life as an artist, a jour­ney whose final des­ti­na­tion, when she sets out, she does not know. Ece Clarke’s tech­nique is com­plex. She uses Som­er­set paper, which she likes for its flex­i­bil­ity. She can bend or fold it at will, often into a cylin­der shape which has to be per­fect before it pleases her. The paper itself bears wit­ness to the stress and strug­gle which has gone into its making, often torn and abraded, but after the storm calm and seren­ity pre­vails. One of sev­eral dif­fer­ent mate­ri­als she uses is bitu­men, a dif­fi­cult mate­r­ial to handle, but she loves it for its his­tor­i­cal asso­ci­a­tions as well for its phys­i­cal prop­er­ties. Mag­nets play an impor­tant part in Ece’s work. Using mag­nets gives her the flex­i­bil­ity she desires, she can move the work around into dif­fer­ent con­fig­u­ra­tions, and it is impor­tant to her that they are a vis­i­ble part of the process. Another clement she employs is smoke, which she uses on paper mounted on alu­minium panels. She likes its mys­te­ri­ous, misty effects, which she achieves with a gas lamp and occa­sion­ally with can­dles. Here too there is the his­tor­i­cal asso­ci­a­tion with the sfu­mato tech­nique used by Old Mas­ters, in par­tic­u­lar Leonardo da Vinci. At times she goes even fur­ther and burns the paper, which she has splashed with water, cre­at­ing crusty tex­tures in the smoky dis­so­lu­tion. Again she docs not know exactly how it will turn out, leav­ing it to chance and a mys­ti­cal belief that the image will emerge. Another small mys­tery which only grad­u­ally reveals itself is her use of jew­ellery. She buys Indian beads and, after reduc­ing their bril­liance with paint, she inserts them into small tears in the paper where they lie in wait to be dis­cov­ered. This hidden aspect of Ece’s work is part of the slow dis­cov­ery which is nec­es­sary to fully appre­ci­ate her alchem­i­cal magic. The tiny hidden clus­ters of beads are at the oppo­site end of the spec­trum from her three tall cylin­ders which stand like sen­tinels guard­ing a citadel. And death shall have no domin­ion.